MP told: Stand up, Say sorry Jump to media player Deputy Speaker Dawn Primarolo orders Labour MP Ian Austin to apologise for referring to a Conservative MP as an "idiot". Which MP was told off for 'lion's roar' Jump to media player The Speaker interrupts David Cameron to warn two MPs about the noise they are making at Prime Minister's Questions. Order! Order! Speaker shows he runs PMQs Jump to media player The Speaker often makes the news for his manner of dealing with noisy MPs in the House of Commons. Speaker: The Prime Minister has finished Jump to media player David Cameron does not welcome the Speaker's interruption as he mocks Labour's appointment of a US election adviser. 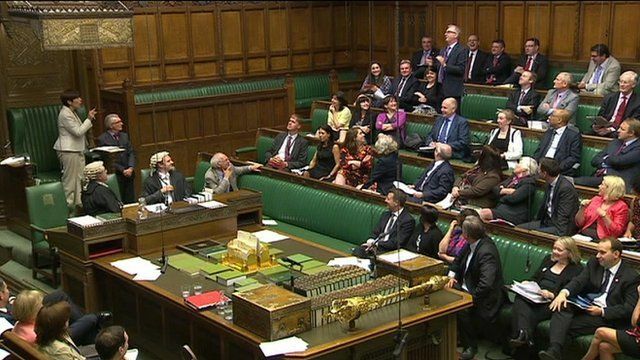 What backbench MPs think of PMQs Jump to media player Backbench MPs said the public only see the House of Commons on TV for the so-called Punch and Judy sessions at PMQs, and some of their constituents are not impressed. Should MPs be less juvenile? Jump to media player Prime Minister's Questions is a weekly bout of name-calling, jeering, finger-pointing and other juvenile behaviour. Education secretary told to write lines Jump to media player Speaker John Bercow tells the education secretary off for shouting during Prime Minister's Questions, and says Michael Gove should write out 1,000 times that he must behave. Deputy Speaker Dawn Primarolo ordered Labour MP Ian Austin to "stand up", and then told him to "say sorry" after he referred to a Conservative MP as an "idiot". The incident came during the last day of the Queen's Speech debate in the House of Commons, and came as shadow chancellor tried to deliver a speech.